From a 16th century portrait to the defining moment of the royal wedding six months ago, 500 years of art history are captured at Moore Allen & Innocent’s Selected Picture Sale on Friday, October 28. 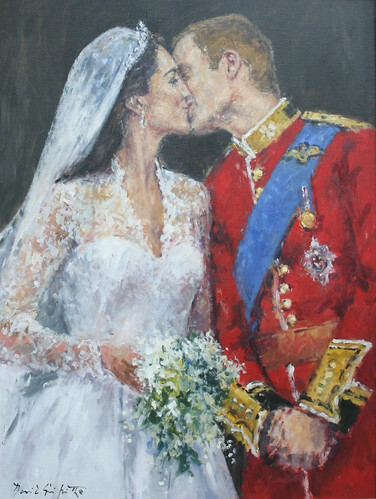 The Kiss, featuring the Duke and Duchess of Cambridge kissing on the balcony on Buckingham Palace following their wedding, has been captured by the renowned portrait artist David Griffiths, whose other subjects have included Prince Charles, Lord Callaghan, Enoch Powell, Archbishop Rowan Williams and Archdruids James Nicolas and Sir Cynan Evans Jones. His pictures are hung in The American Embassy in London, The House of Lords, and the National Library. And the successful bidder will be able to add their own address to this distinguished list. Bids of £600 to £900 are expected for the 1m tall oil on canvas. There’s a right royal theme running through the sale, with two more of Griffiths’ paintings, December Light – The Mall (£400 to £600) and Royal Procession on Horse Guards Parade (£500 to £800) joined by another portrait of the royal family, this time by a world-famous photographer. Norman Parkinson was a portrait and fashion photographer for Vogue from 1945 until 1960. A copy of the official photograph to celebrate the 80th birthday of the Queen Mother in 1980 – featuring the Queen mum between Queen Elizabeth and Princess Margaret – is signed by the photographer, is numbered 16 of a limited edition of 1,000 and carries an estimate of £40 to £60. But it is Parkinson’s portrait of the princes of pop – The Beatles – which is causing considerable interest. The Beatles, The President’s Hotel, Russell Square, 1963 is a signed black and white portrait measuring 36cm wide and carrying an estimate of £800 to £1,200. With Griffiths’ and Parkinson’s work representing the contemporary end of the sale, there are some big names associated with the older pictures too. 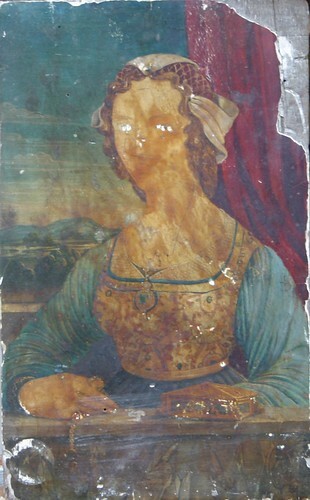 A small (28cm) portrait of Lady Seated at a Window, painted in the manner of the Renaissance artist Sandro Botticelli, is attributed to the 16th century Continental School. Despite being around 500 years old, a bid of £100 to £150 should secure the oil on panel. The last time valuers at Moore Allen cautiously attributed a portrait to a follower of Rembrandt it sold for £2.2 million: a record for an auction of a painting outside London. Will the portrait of a Saint in Red Robes – attributed to a 17th century follower of Rembrandt – attract as much excitement? Only time will tell, and the auctioneers have put a £1,000 to £1,500 estimate on the 71cm tall unsigned oil on canvas. Also from the 17th century is the cheerful sounding Naked Figures in the Flames of Hell, ascribed to the Continental School. Painted in oils on wood panels, and bearing an old wax seal collection stamp to the rear, the 1.5m wide painting carries an estimate of £3,000 to £5,000. From the continent back to the Cotswolds, and a trio of engravings by Johannes Kip (1653–1722) feature local scenes. Cirencester, the Seat of Alan Bathurst Esq, and The Abbey in Cirencester, the Seat of Thomas Master Esq, are black and white engravings measuring 44cm and 40cm respectively. They carry an estimate of £300 to £500 for the pair. Meanwhile, a coloured engraving at 47cm, Cirencester, the Seat of Alan Bathurst Esq, commands an estimate of £300 to £500. And over in the book section, a first edition copy of Cider with Rosie, signed by the author Laurie Lee and dated 26th June 1960, carries an estimate of £200 to £300. Art Critic magazine said of Farrer’s work: “Its intersubjectivity works on many levels with a multiplicity of effect depending on the viewer’s beliefs.” Conversely, Farrer has compared his art to ‘a fight between a badger and a stoat in a magical Wonkeresque factory that has the ability to make things get bigger and often sillier’. It wouldn’t be a Cotswold picture sale without some hunting scenes, and the sale features no fewer than six paintings by the celebrated horse and hounds artist Jospeh H Sulkowski. Among the best are Labrador with Purdey Guns – a gunmaker the auctioneers know a lot about; they sold one at the last Sporting Sale for £3,200 – which stands at 1.3m wide; and Guns and Trophies, which features shotguns and the mounted skulls of game animals, and measures 1.5m across. Both oils on canvas are expected to achieve between £3,000 and £5,000. 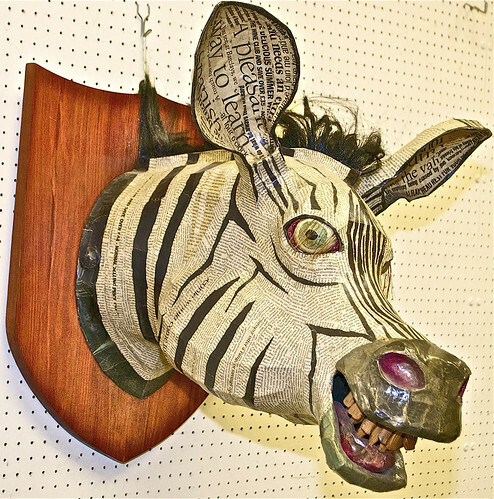 And one hunting trophy that doesn’t take itself too seriously is Zebra by anarchic sculptor David Farrer. 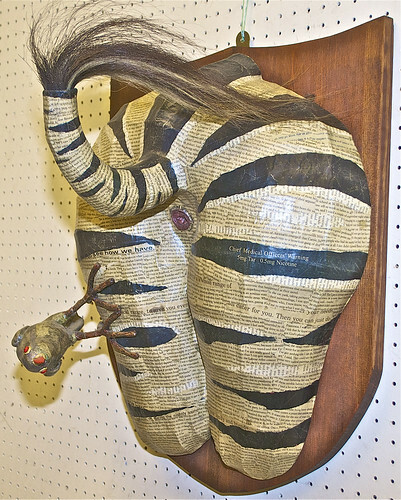 Being sold in two lots, Lot 128 features a wire banded papier maché and horsehair sculptural study in newsprint of a head mounted upon a wooden trophy shield, while Lot 129, Zebra Bum with Ox Pecker, feature’s the beast’s rear end, tail raised, also mounted on a wooden shield and in newsprint. Each piece, dated 1999 and carrying the David Farrer label, carries an estimate of £800 to £1,200.